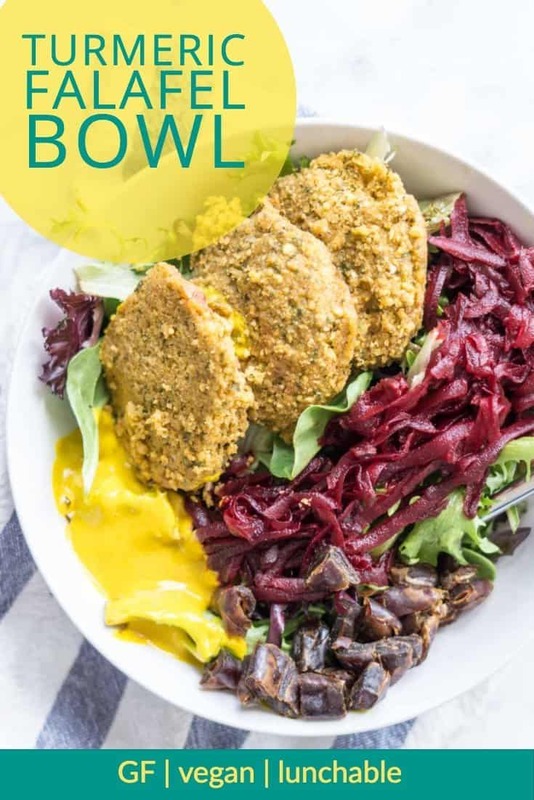 This turmeric falafel bowl is vegan soul food in a bowl! 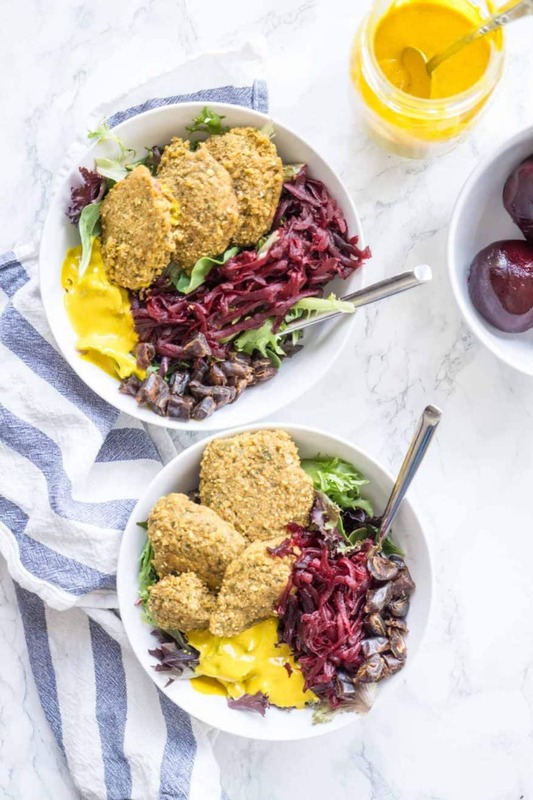 Fresh greens, earthy beets, and sweet dates compliment the spicy falafels and umami filled dressing. True words I spoke to my husband today. But then we had a good chuckle because he knows how much I also love fine European cheese, and going out for a special steak dinner. So no, while I don’t foresee myself ever excluding myself from animal products entirely, we do eat a lot of vegan meals in our house. I don’t need the vegan label to reap the benefits of this diet! One such benefit of the vegan diet is this lovely buzzword: G U T. H E A L T H ! I’m going to be you and your guts’ new best friend because I’m here to answer those million dollar questions! Lucky you, I’ll do it for free! One component of a healthy gut is the diversity of micro flora (ie: bacteria and yeast strains) present in your gut. The current consensus is that a wider diversity = better gut health. easy way of identifying people who have a wider diversity…..
Those with a wider diversity were the people who ate a wider diversity of plant foods! It didn’t matter whether someone ate an entirely vegan or an omnivorous diet, what mattered was the number of different plant foods eaten over the course of a week! Those who ate more types of plants had healthier guts! Lucky for us the researchers left us with a specific minimum number of plant foods to aim to eat in a week. And that number is 30! 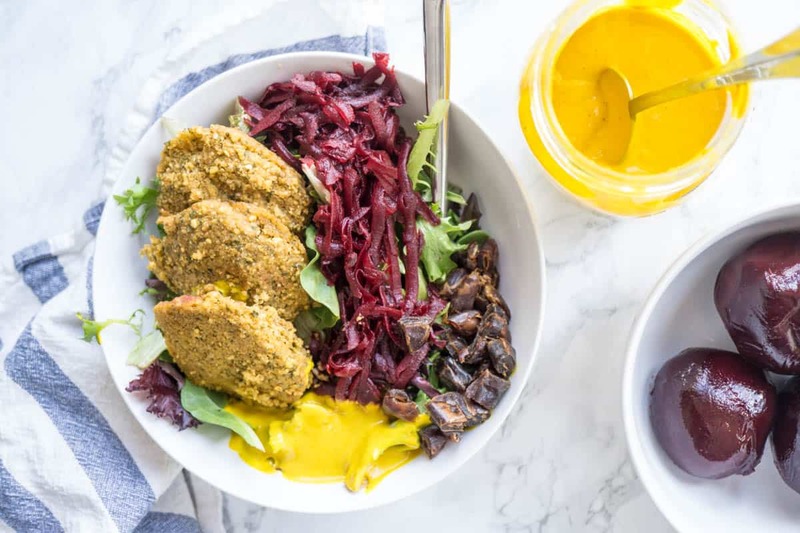 With this turmeric falafel bowl recipe you’ll start your week off strong with a grand total of 14 plant foods! You’re nearly halfway there! Looking for other recipes that feature turmeric? 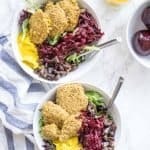 Vegan soul food in a bowl! This recipe hardly requires instructions: simply layer ingredients in individual bowls, stir, and eat! My recipe I’ve linked to includes eggs so they wouldn’t be vegan but I also really love the boxed mix for falafels from Trader Joe’s!